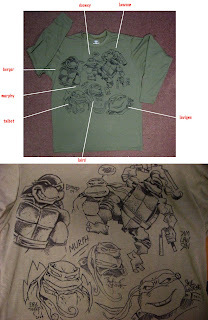 Peter Laird's TMNT blog: One of a kind! Act now!!! BUY THIS SHIRT!!! oh man, if only it were a medium! Yeah... even in this economy, I'd definitely spend money on that. I see someone actually asked Mike if he'd take $20! Of course, he politely stated that he would be letting the auction run to the end. Worth a shot I suppose, but $20? LMAO. Besides, you find me a bar where 7 guys can all get a GOOD beer for $20 and I'll move there tomorrow. You boys enjoy your brewskis, now. -->> i wonder how much beer was spilt on the shirt ..
.. i see a mustard and pretzel stain on the lower left corner as well. Man, this shirt is all kinds of special! I'm guessing my bid won't last long. Wow, that's gunna buy quite a night on the town. have fun guys!